Last week brought phenomenal news. The Road to CA show in Ontario, CA -- where I hope to possibly teach in the future, took place. This is a big show, on a level just beneath Paducah and Houston. 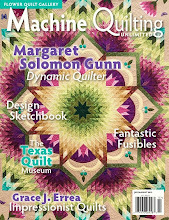 It attracts many well-known talented international quilters. Much to my complete surprise, on Tuesday night, I received an email with the results of the judging. I had 2 quilts out there. 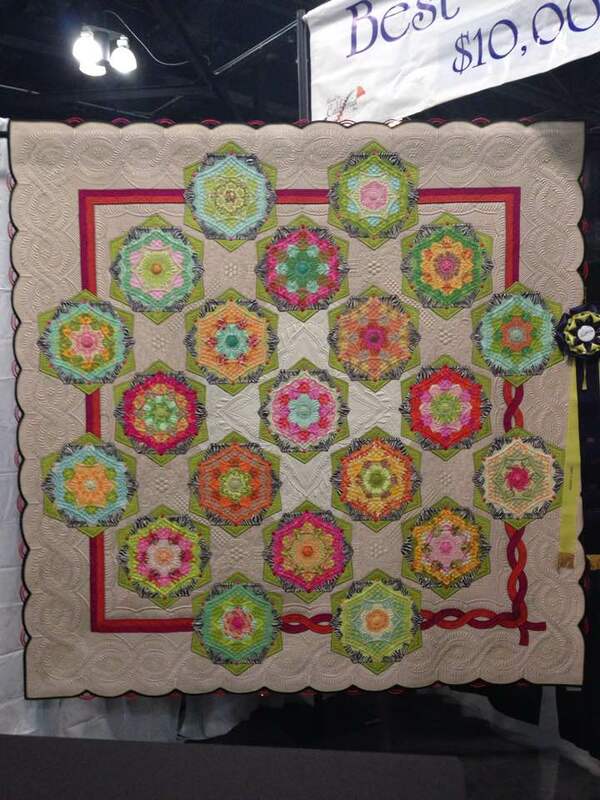 My new quilt just finished last October, won the top award! Best of Show at a show like Road is still kind of unthinkable for me. This is a fun and personal quilt for me. 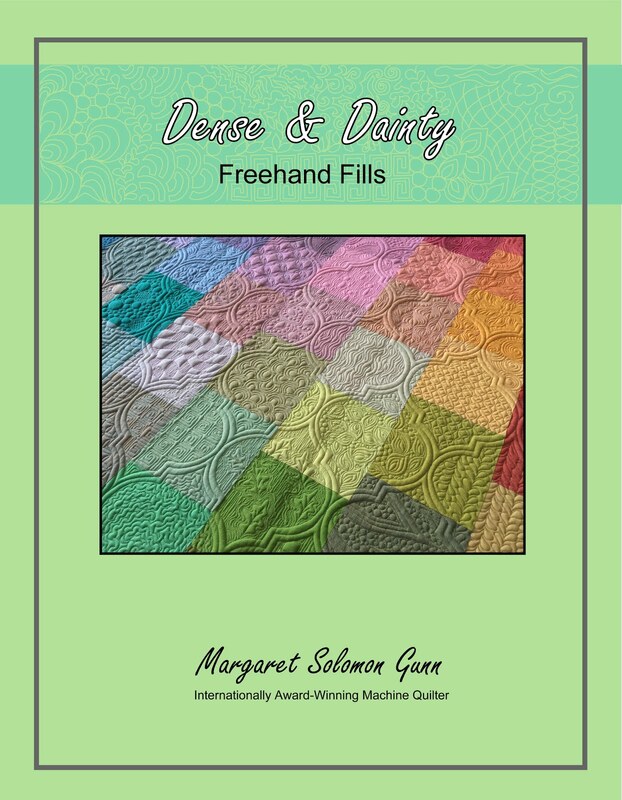 It represents fabrics, colors and processes that speak to me, and to have it rewarded so well is sweet. And yes, that is one monster-sized ribbon, over 3' long! 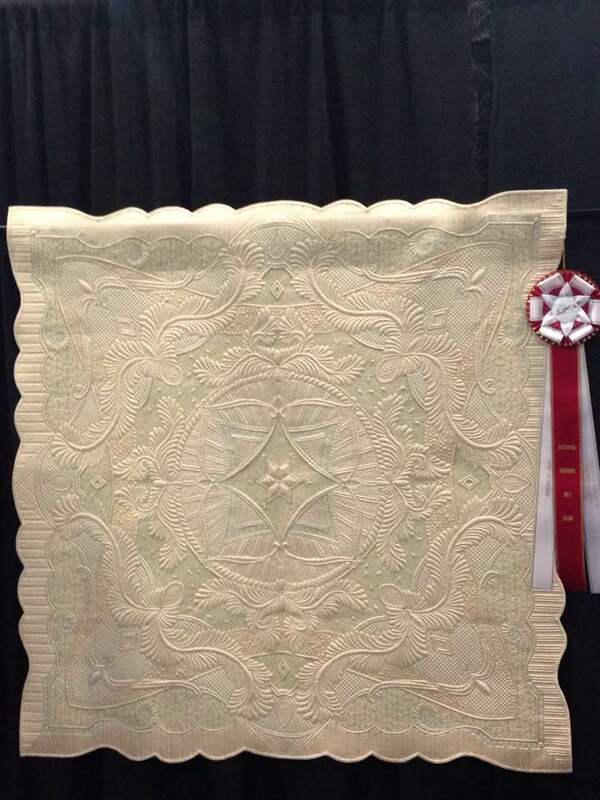 My other quilt that was there, From the Bride's Trousseau, also did well -- Outstanding Traditional Quilt. This is another of the top and very well paying awards. It is hard to believe. 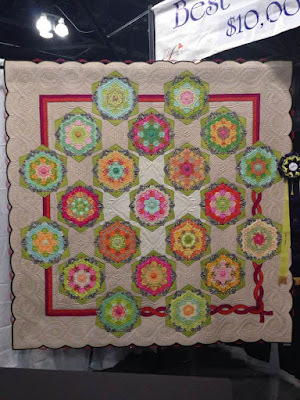 I was considering retiring this quilt before it was sent to Houston, where it ribboned. It may have a show or two left to attend. It has certainly exceeded my expectations for a little whole cloth quilt. 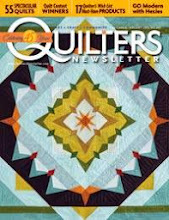 While the show was going on, I was here in frigid new England quilting on my client's quilts. This is Carol's. She from Panama - can't you tell by her warm, sunny choice of fabrics?! I love the orange. She hand pieces her quilts too. I did a mini for her a couple years ago that was this same pattern. This one is 70" square. By the end I was getting mighty tired of ditch stitching these circles, but it turned out wonderfully. When she gets it back, she'll be happy. here's a closeup...It has wool batting, and orange YLI Polished poly thread. I ditched every circle, and they were echo quilted twice to make the framing show more. These are done with continuous quilting across the entire row. How, you ask?...bu sneaking in the ditch now and then where it won't show. I'd never do this with all the apparent stops and starts. Her backing is crazy busy, so it hides everything. It would have been totally different with a solid backing. I'm up to more little projects than I can count or show. Here's a sneak peek at one of them. I have started (well, now it is closer to done) hand-painting a part of this new show quilt. It has a name now, "Taking the Uncharted Road". It seemed like a fitting name with it's mariner's compass and the binding that most certainly did not come with directions. I have a couple of other surprises, but they will come out in due time. Right now, I am trying my best to prioritize that which must get done, and I am not entirely sure it will. My mood is deep in the dregs of winter. The new president and his petty, unnecessary ways have me feeling sad and depressed, and not as productive as I'd like to be. Nobody wants to read about a political sob-story on a quilting blog, but suffice it to say he is a complete embarrassment, and I am ashamed to be an American right now. He is everything I thought he'd be during his campaign and more. Sadly none of it is good. I have a bad feeling, and it is hard to shake. There, said. Done. Now we can get back to the goodness you came to this blog for. Well, Heavens to Betsy...Look at that - Somehow half of January crept by without me realizing that my blog hadn't been updated. I have certainly been busy (perhaps not quite as productive as I ought to be, but definitely busy doing something!). Much of my time recently has been spent working out the details and creating the samples for my new classes which will debut this April at MQX. 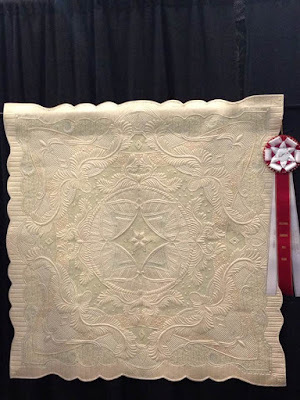 You all know by now that this is definitely my favorite quilt show. It's a real good thing too that it is under 2 hours from home!! Oh, and a tidbit of book news. My AQS book, though delayed, is moving as quickly thru the editing process as possible. Nobody wants it done and published more than me and my AQS editor. 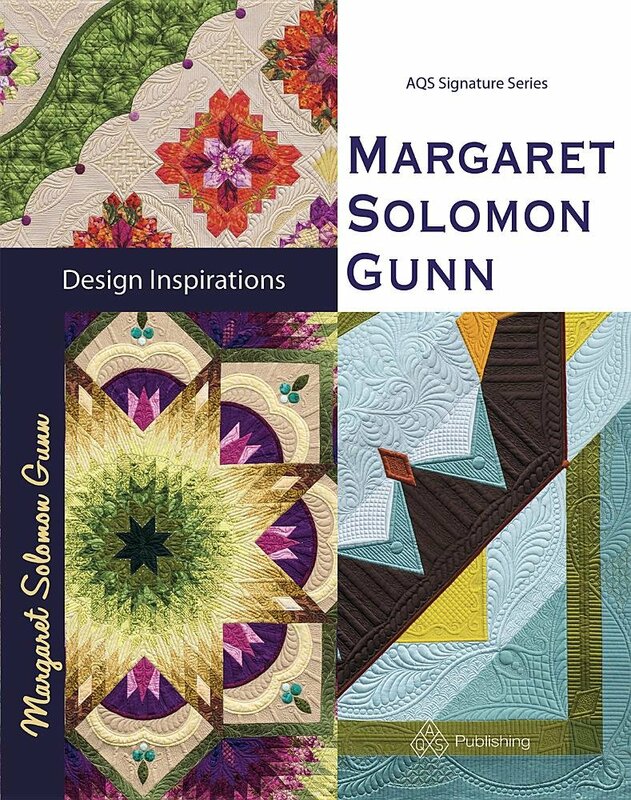 Due to their downsizing, a small yet pertinent detail that the book WAS supposed to contain the quilt patterns seemed to slip through their cracks. It has been resurrected, and they have this detail to get put onto CD, and then she's off to the printers! AND <> I have the complete manuscript for a second book which I am self-publishing all done. I have already printed a proof copy, and am currently researching possible local print shops to run the books for me. 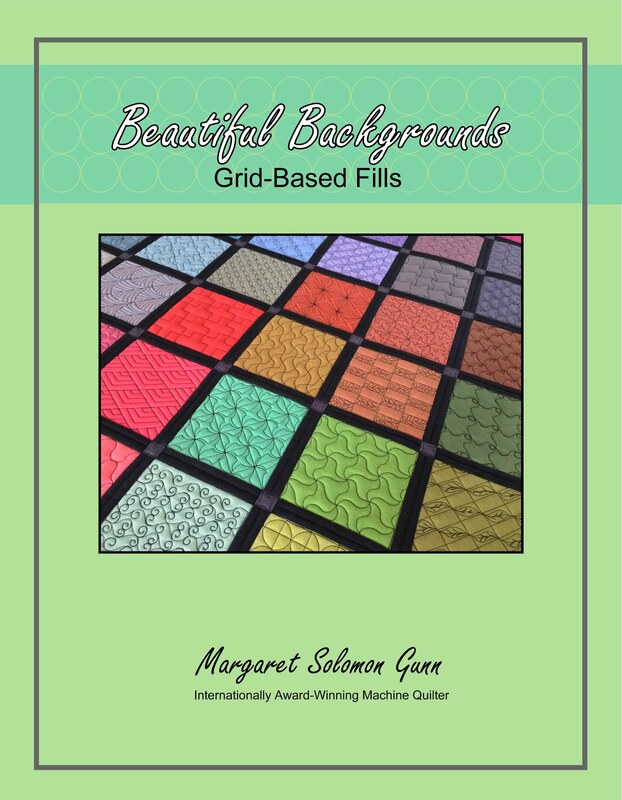 It is about the Grid-Based fills, and will accompany one of my favorite classes that will be taught at MQX. Now, if I can get kids in school, husband outta the house, I just might make the other self-published book I have on my back burner, if not by April, then soon after. Phew... yes, I have been busy. Let me tell you about this award. It does not have to be given to a teacher that is teaching at MQX this year. It will go to the teacher that inspired and educated the most. If you find it in your liking to nominate or vote for a teacher, here is the link. Be sure that you write something though about how or what this person did because those voting on the recipient are looking more specifically at what the teacher did, than the quantity of votes. 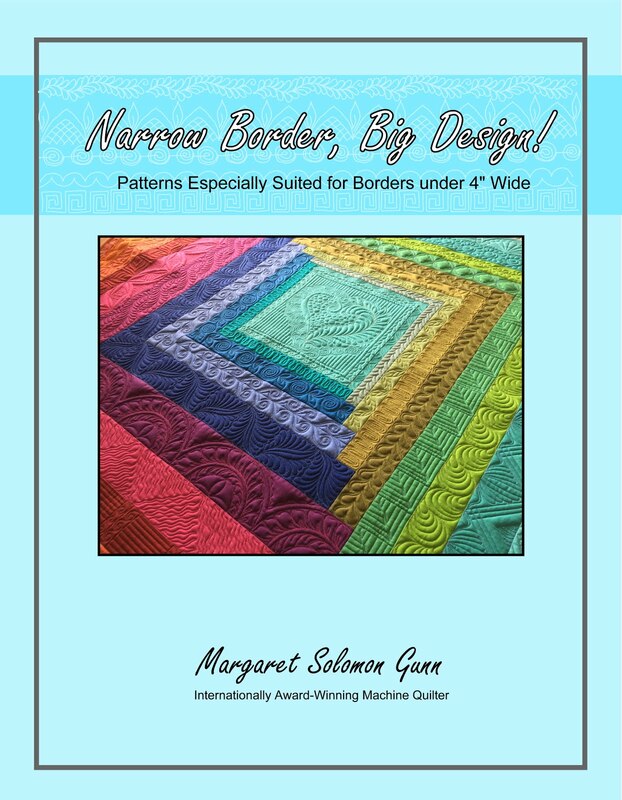 I am gearing up to custom quilt a couple of beautiful client quilts, just as soon as their batting arrives. In the meantime, here is a glimpse at some of my craziness. This is my quilt that will actually debut at MQX. I have yet to choose a name, but it is coming right along. The very-crazy binding/edging has been an adventure and a half, and I am sure you'd love to hear about HOW exactly I made it, just as soon as it goes to show. I am getting ready to (maybe) add some hand-painting to the interlocked arches around the NYB blocks. It's still a big "maybe", because I am kind of chicken to take the first step! When not writing or editing, I have been busy like a bee creating some samples for my new classes. This is a sneak peek of one of them. 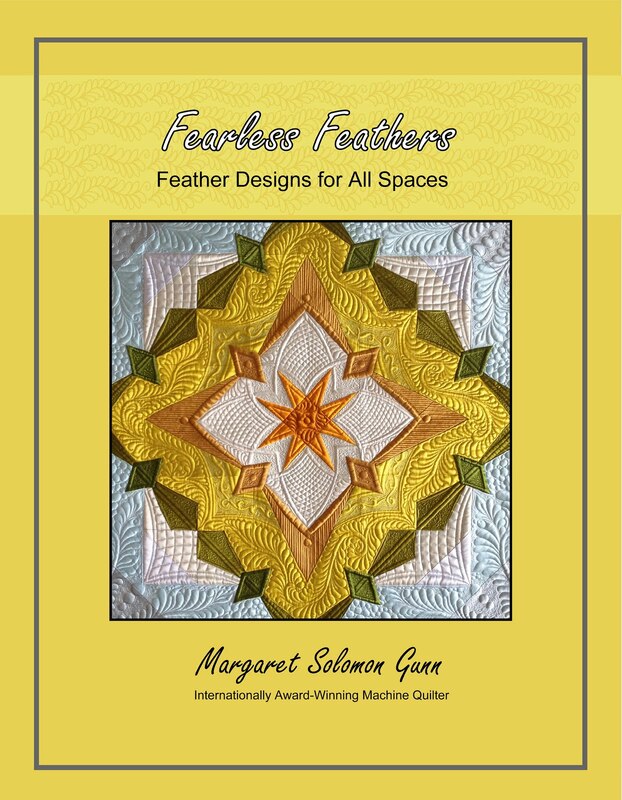 When I am done, I will have several similar mini-quilts, all geared to assist in showing my design process. Thank goodness to my mother, who made time to whip up 2 of these star blocks for me. Though my class is technically full, I am very likely to be trying to teach this class at other venues as well, including MQX midwest in late September.